You are here: Home › Whittier – Stands in the Gap with Underwear! Whittier – Stands in the Gap with Underwear! 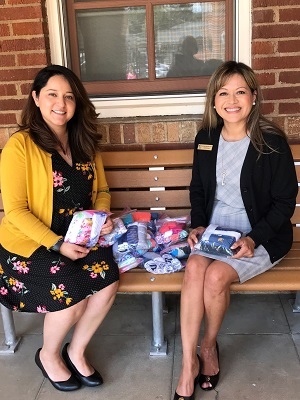 Superi ntendent, Dr. Maria Martinez-Poulin (seated right) with Gladys Huerta, Coordinator of Student Services (seated left) accepted 132 pair of underwear for children (girls and boys) who have accidents at school. Each of the nine (9) elementary schools will receive a package of girls and boys underwear. All data based on fiscal year 2014.